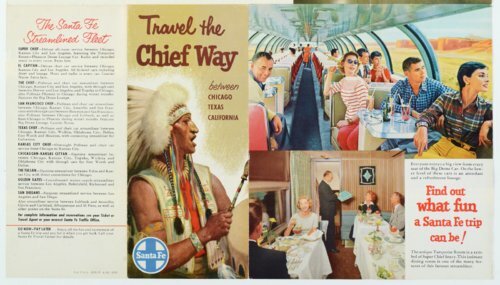 This is a brochure published by the Atchison, Topeka & Santa Fe Railway Company promoting travelers to take one of the railroad's many fleet of streamliner trains for a cross country adventure between Chicago, Texas and California. One side of the brochure provides a list of the streamliners while images and illustrations capture the comforts aboard the famous trains. On the reverse side there are additional illustrations that show the comforts and luxuries offered on various streamliners. The backside of the brochure has illustrations and images that show a variety of tourist attractions across the United States. A map showing the Atchison, Topeka & Santa Fe Railway System is also provided.